Out of tragedy the rich historical past of the ancient city of Pompeii was preserved under a thick layer of volcanic ash, ready for you to experience as part of your Italy vacations and Naples tours. Uncover this ancient city near the beautiful Bay of Naples by adding Avventure Bellissime’s Private Naples to Pompeii and Vesuvius Excursion or Private Naples to Pompeii and Amalfi Coast Trip to your Italy Vacation packages. 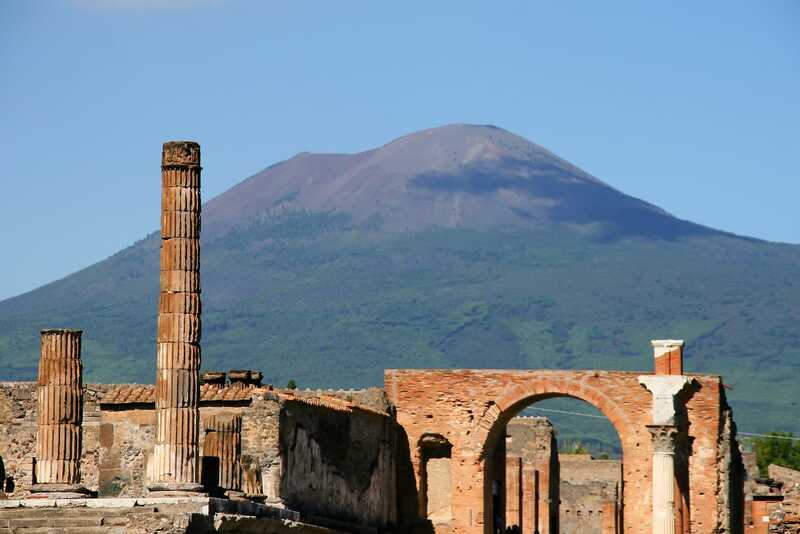 Mount Vesuvius erupted and nearly eradicated the bustling ancient Roman city of Pompeii in 79 A.D. It was a busy port city and the volcano claimed thousands of lives that fateful day. The volcano itself is hundreds of thousands of years old and history has documented more than 50 eruptions - but none more devastating nor widely known as that of 79 A.D.
That area of the Bay of Naples is known to have been settled since about the 8th century B.C. when the ancient Greeks were drawn by stunning scenery to live here. Then, as now, the region around Pompeii was a vacation destination for wealthy and cultured citizens of the ancient world. By the first century A.D. wealthy Roman nobles and merchants had extravagant villas and homes in Pompeii. The city boasted superbly engineered aqueducts, paved streets, taverns, restaurants, bathhouses, and a flourishing businesses that included everything from artisans and tradespeople to brothels and marketplaces. In an interesting parallel to modern Italy, Pompeii relied on the tourist industry to bolster the local economy. At the time Mount Vesuvius erupted an estimated 20,000 residents lived in Pompeii and outlying areas, including wealthy citizens, government officials, townspeople, and slaves. Life was quite comfortable, with aqueducts to bring water, hot baths available to citizens in the bathhouses, open-air squares, and a huge arena for entertainment and events. Most citizens fled when the volcano started rumbling, some barely escaping the blanket of ash and poisonous gases when they took to the water of the Bay of Naples. On the 24th of August, about one in the afternoon ...A cloud, from which mountain was uncertain, at this distance (but it was found afterwards to come from Mount Vesuvius), was ascending, the appearance of which I cannot give you a more exact description of than by likening it to that of a pine tree, for it shot up to a great height in the form of a very tall trunk, which spread itself out at the top into a sort of branches; occasioned, I imagine, either by a sudden gust of air that impelled it, the force of which decreased as it advanced upwards, or the cloud itself being pressed back again by its own weight, expanded in the manner I have mentioned; it appeared sometimes bright and sometimes dark and spotted, according as it was either more or less impregnated with earth and cinders. Today scientists refer to this type of eruption as a Plinean eruption and explain that it creates a pyroclastic surge, which is a force created by superheated poisonous gases, crushed rock, ash, and pumice. The extreme temperatures evaporated the bodily fluids of those left behind in the city, an agonizing death that mercifully must have been swift. Experts have compared the effect of the blast to the equivalent of multiple Hiroshimas and many visitors say visiting the ruins of Pompeii is a life-changing experience. Following the eruption, fine ash and layers of rocky debris covered the city of Pompeii as well as the nearby towns of Stabiae and Herculaneum, preserving everything as it was that August day in 79 A.D. Centuries later the ruins were rediscovered and have been painstakingly unearthed to reveal what life was really like for ancient Romans on the Bay of Naples. Almost miraculously the buildings - including intricate mosaics - were preserved perfectly underneath the layers of dust, dirt, and rock. Over three centuries of excavations, it has been possible to observe the skeletons and final resting positions of the victims of the disaster. All around the objects of everyday life remain intact - jars, dishes, household items, and more. Today there are nearly three million people who live and work in this region of Italy and Mount Vesuvius is still an active volcano. Experts are watchful for signs of danger and the last time the volcano erupted was in 1944. Combining a trip to Pompeii with an excursion to the spectacular Amalfi Coast is a wonderful way to explore the rich historical past as well as the beauty of the region. Ready for an unforgettable holiday to Italy? 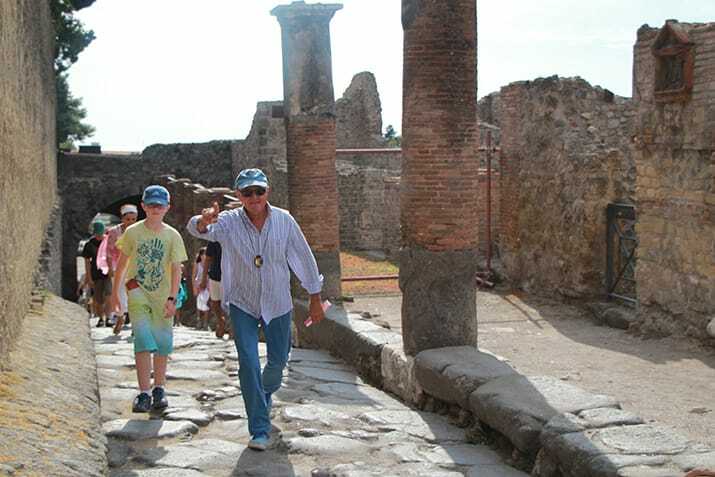 Avventure Bellissime’s Private Naples to Pompeii and Vesuvius Excursion or Private Naples to Pompeii and Amalfi Coast Trip will take you back in time to understand how lives were lived in Ancient Rome. Visit Avventure Bellissime online now to book Italy vacation packages and Italy tours.